The book of Luke provides gentile believers certainty concerning the nature of salvation through Christ. A correct perception of Luke’s purpose enables a clear understanding of its role in conveying its narrative. This understanding is imperative when regarding Christ’s announcement, birth and appearance, ministry and service, instruction and submission and about conquering and commission. Having an understanding of Luke’s overall purpose is vital to providing clarity about the book’s theme and structure. 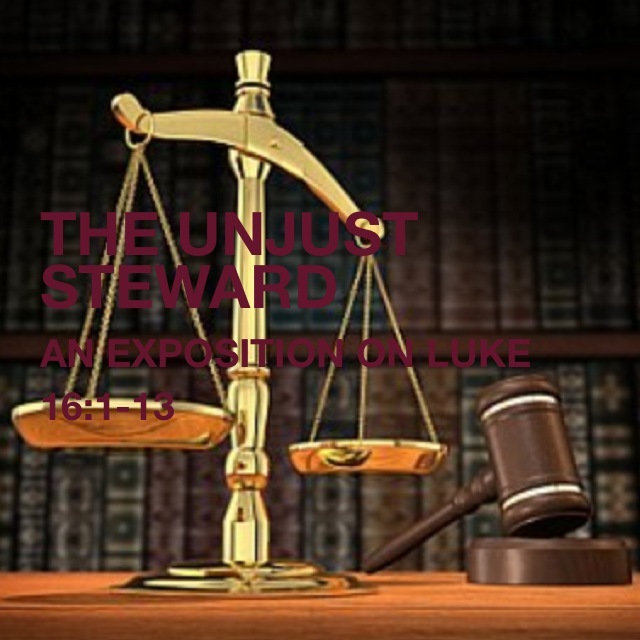 This gives the reader a fuller understanding when approaching the parable concerning, for example, the Unjust Steward. This particular parable concerns a dishonest money manager that becomes labeled a wise and faithful servant after using material wealth in an effort to gain eternal treasure. The reader is able to see that Jesus is telling a parable of two individuals that are using the rules of the sinful world to get the best of one another. This only becomes clear when the parable is kept within its proper context about “the consciousness of the end – which implies accountability.” Yet, most commentators seem to agree that this parable is one of the most difficult to interpret since it goes against the grain. The Unjust Steward parable does not go against the mold of righteous narratives about good people that should be imitated since many commentators have simply over analyzed the parable to defend Christ’s words. The purpose of many of the parables is to give individuals examples of people to imitate themselves after, which includes those of the Sower, the Prodigal Son, the Good Shepherd, and the Lost Coin. Then there are others who speak of people that are not admirable, for example, a fool who seeks to ensure his future by building bigger barns. In comparison to these examples, the Unjust Steward parable goes further by conveying a narrative of a man that undoubtedly has a wicked heart. Yet, the apparent unjust steward is commended as a man of wisdom. There are several specific keys to interpretation that aid an individual to understand this parable. First, readers must not linger on the steward’s commendation and must focus their attention on the parables significance in Christ’s ministry. Additionally, readers must remember that it was part of Christ’s mission to illustrate the stark differences between evil’s control of our world and the coming kingdom of God. Thereafter, readers must remember that the parable is placed behind a narrative that is focused on God’s given forgiveness and grace. Hence, the purpose to convey that humanity’s attention cannot be halfhearted. The parable “has no edifying moral lesson [since] it’s a story about the improbability of grace.” It is a conscious decision to ignore God to follow the rules of this world to prosper now or accept God’s grace and follow His eternal law to prosper eternally. In various sections of Amos, particularly chapter 8, the prophet is indignant about practices that take advantage of the poor; the rich violate the religious law to gain time for dishonest practices that result in people being sent into slavery. Nevertheless, commentators have found it difficult to agree on the Unjust Steward parable as it “seems to condone the very kind of skullduggery against [which] Amos rants.” Commentators have actually made the parable difficult when it is not. There is contextual information within the parable and historical background that aid the proper interpretation of the passage. The commercial practices of the parables time period aid in the interpretation, when taken into consideration. This is clearly illustrated with the Jews being prohibited to charge interest on loans they have given to fellow Jews. Thus, those that desire to make a return on given loans evade this law with the reasoning that the law’s concern was with barring the exploitation of the poor. However, the law “was not meant to forbid innocent transactions that were mutually beneficial and where the payment of interest amounted to the sharing of profits.” Furthermore, those that had commodities were not considered poor; therefore lending to them was not considered exploitation. Consequently, it was possible to use legal fiction as a basis to charge interest since it was common for many to have possession of some oil or wheat. The loaned amount was given a value in relation to wheat, oil, the addition of interest, and the bond concerning repayment to be paid in oil or wheat. These types of transactions were done by stewards and generally transpired without the owner being aware. The steward is a professional money manager who is hired to direct the business affairs of a rich man. The nature of the manager’s duties gave him the ability to be careless and misappropriate money for his benefit. The rich man heard legitimate rumors of the manager wastefully (the verb “wasting” is also used in verses 15:13 and 16:11) using his goods. Therefore, the rich man made known his intention to fire the manager upon demanding the full accounting of the losses, which also implied the rich man’s intention to seek restitution through legal or direct means. The rich man’s instructions gave the manager time to develop a way to resolve the issue at hand. He understood that the rich man was not aware of all the losses and that a full accounting would reveal his own improper management. In an effort to resolve the issue, the steward contemplated begging only to decide that he could not because he found it to be shameful. To avoid being fired and taken to court, he developed a plan to lower the losses to the rich man’s account which would leave him with a smaller restitution to pay. Moreover, such a plan gave him the opportunity to reform his bad reputation within the community by obtaining favor with those he had dealt with. The manager’s plan entailed accepting reduced payments from those that had outstanding debts. The settlement of the first account at half of what was owed likely occurred due to the particular mans ability to pay that sum immediately. A second example was given where a man was allowed to replace one hundred measures of wheat with eighty: “The measure here is the koros, about 10 bushels, making the total approximately 1,000 bushels.” It is apparent that large quantities were involved in these transactions. Furthermore, the involvement of various commodities resulted in the steward varying the discount he gave. The plan that the manager deployed was considered smart according to the wisdom of the world. This is confirmed through the rich man making it known that he believed that to be the case. It is believed that Jesus gave praise bestowed upon the manager. This is actually not the case as Jesus actually called him unrighteous. This occurred by Jesus offering the praise bestowed on the manager through the mouth of the rich man. The rich man’s verbal support of the manager’s actions leaves us to believe that both men were similarly unrighteous in their activities. The parables concluding verses do not tell a narrative regarding business, but one about the focus of an individual’s life. The parable concerns a decision between being controlled by evil in our lives and having a desire for the kingdom of God. This either results in those that live according to the world following the world’s standards or those living for the kingdom of God following the standards of God. The way that individuals decide to live determines how their mammon (“wealth”) will be used. Those that live according to the world will use their wealth for selfish gain while those living according to the standards of God will use their wealth in an unselfish fashion for God’s gain. The use of true mammon or false mammon may imply that there is commonly some element of unrighteousness in the way people acquire possessions. As a result, “Jesus’ followers must use their money for their spiritual purposes just as wisely as the children of the world do or their material aims.” It is the aim of Christ’s followers to store up their eternal treasures (“wealth”) in heaven (not in this world) where they will last forever. This accomplishment will enable us to develop lives that will not be based on material possessions that can be easily lost and will not bring forth friendships that will not stay faithful in tough times. Having such a focus does not leave us poor or friendless, but will actually leave us with greater wealth and stronger friendships that we could ever imagine. This passage concludes with Jesus articulating that an individual cannot serve God and money at the same time. The use of “wealth” and “money” in the passage is a figure of speech that conveys a parallel meaning through an associated label. This segment of the passage delves into making the point that what people do with the small things in their lives will be what they do with the larger things.Charles Swindall echoed this point stating: “[i]n accordance with the principle laid down in [verse 10] anyone who uses money in the wrong way shows himself unfitted to handle more important things.” This idea is taken a step further when we consider that everything in our possession is not ours but His in the first place and that we are nothing more than God’s own stewards (“managers”) in this world. Thus, those who are not faithful in the little things in their own lives are not fit to handle the things that belong to God. The term used (“mammon” for money and wealth) symbolizes the methods and values associated with the world. Money in itself is not inherently evil or able to control an individual’s actions. This passages usage of “mammon” is referring to an individual’s devotion to serve money over God. In short, the parable conveys that when evil reigns, everything in this world becomes acceptable for an individual to do when attempting to achieve their goal or goals. As a result, an individual must choose to serve money or God. Though there are undertones that address the Pharisees, the parable is primarily for the benefit of the disciples. As a result, it is important to understand the use of “unrighteousness” to be aware of this passages appropriate context. Therefore, it is important to understand the term within its proper context, which is concerning worldly “mammon” (material greed or wealth). However, Jesus is not making this reference to convey that the disciples should unjustly gain wealth to only be generous with the obtained wealth. This particular parables purpose, considering the principle being illustrated, is concerning the difference between an unjust steward and a just steward. This is taking into account that the unjust steward is considering his “clients” resources as a means to providing for his own personal pleasure and advancement within the community. Therefore, taking this into consideration, Christians can perceive two lessons that can be applied in their lives. The parables conclusion is concerning Christ’s desire for His disciples to appropriately model their lives to only look to Him as their only master as righteous stewards. Living this way results causes a Christian to see all their possessions as given as a gift from God. In addition, such a lifestyle also causes Christians to realize that they act as Christ’s stewards in this world to appropriately use His resources to advance the Fathers goal or goals. The key to being a righteous steward is accomplished by acting as an individual that is not self-centered (“egocentric”) and places God as the focal point in every aspect their own life (“theocentric”). Therefore, a theocentric steward is an individual that has a greater love for God than for the resources they have been blessed with. Such a theocentric love results in Christians having intent to use their blessings for the explicit benefit of other people. In short, those that genuinely love Him will passionately give of their blessings to fulfill His desires. The principle of faithfulness is further developed in the parables closing verses. Jesus explains that an individual who is faithful in little will then be faithful in much. Likewise, an individual that is dishonest in little will then be dishonest in much. This explanation makes the point that an individual who cannot be faithful with wealth on earth cannot be entrusted with “true riches.” The use of “true riches” in verse 11 is a reference to our stewardship and responsibility in the kingdom of God alongside all the heavenly rewards. This reaction to wealth will occur when an individual has sincerely placed their faith in Christ. The Apostle Paul declared that the Spirit lives within each Christian and that His life is reproduced in us. The whole purpose of the Christian walk was summed up well by Paul: “I have been crucified with Christ. It is no longer I who live, but Christ who lives in me. And the life I now live in the flesh I live by faith in the Son of God, who loved me and gave himself for me.” Therefore, our “flesh” has been crucified with Christ and it no longer has the right to continue on living. It must be clarified that the crucifixion of the flesh is not done through our own abilities or power. Paul stated that no such thing is even needed as Christ’s work on the cross resulted in our complete reconciliation with God. Paul contends in Colossians 2 that a man oriented philosophy is false due to it not being based on the love of wisdom. This view was articulated due to Paul’s belief that a man centered philosophy does not originate from God. In addition, he contends that their beliefs came from the tradition of men that included the practice of following rituals and religious days, and the pursuit of visions and experiences. There are many within the Christian circles that are currently attempting to accomplish righteousness through similar actions counter to Paul’s teaching. There is no need for Christians to follow a man centered philosophy as a result of their faith in Him has resulted in them receiving the fullness of Christ in their lives. As a result, there is no need for disciples to follow the “traditions” in their own power to become a righteous person since the works of the flesh have been replaced by Christ. In short, the Christian is to have a dependence upon Christ to live within them and have a willingness to allow the Spirit to transform them according to His desires. Luke 1-4:14; Luke 4:14-9:50; Luke 9:51-19:27; Luke 19:28-24:53. Douglas John Hall, The Steward: A Biblical Symbol Come to Age (Grand Rapida: Eerdmans, 1990), 48. Cf. Leon Morris, The Tyndale New Testament Commentaries: Luke (Downers Grover: IVP Academic, 1988), 268; Justo Gonzelez, Belief A Theological Commentary on the Bible: Luke (Louisville: Westminster John Knox Press, 2010), 190; Charles Swindoll, Swindoll’s New Testament Insights: Insights on Luke (Grand Rapids: Zondervan, 2012), 390; Dave Matthews, “The Parable of the Unjust Steward (Luke 16:1-13): A Reexamination of the Traditional View in Light of Recent Challenges,” JETS 38 (March 1995), 29 – 39. Luke 8:1-15; Luke 15:11-32; John 10:1-30; Luke 15:8-10. Eugene Peterson, “Gospel Rascals,” Christian Century (2008): 30. John Donahue, “Balancing the Books,” Twenty-Fifth Sunday in Ordinary Time (2001): 185. Leon Morris, The Tyndale New Testament Commentaries: Luke (Downers Grover: IVP Academic, 1988), 269; Exodus 22:25; Leviticus 25:36; Deuteronomy 23:19. Morris, Tyndale New Testament Commentaries, 269. Eugene Peterson, “Gospel Rascals,” 32. Swindoll, New Testament Insights, 290. Morris, Tyndale New Testament Commentaries, 270. Cf. Swindoll, New Testament Insights, 291; Morris, Tyndale New Testament Commentaries, 270. Swindoll, New Testament Insights, 391. Morris, Tyndale New Testament Commentaries, 271. Swindoll, New Testament Insights, 291. Morris, Tyndale New Testament Commentaries, 272. Swindoll, New Testament Insights, 293. Morris, Tyndale New Testament Commentaries, 273. Frederick J. Streets, “Accountability,” The Christian Century (1993): 110. Previous PostHe is Risen, He is Risen IndeedNext PostMary, Did You Know?